New Disease Reports (2004) 9, 43. During February 2004 a leaf blight disease of tomato (Lycopersicon esculentum) was observed in a tomato field at the Nuclear Institute for Agriculture and Biology, Faisalabad, Pakistan. Symptoms on affected plants started with yellowing and browning of the lower leaves, progressing upwards under high humidity conditions. Symptoms often developed from the leaf tips and along the margins of the leaf petiole. Under severe infection, lesions enlarged and coalesced causing blighting of the leaves. Concentric circles with dark layers of spores were observed under moist conditions on blighted leaf portions. Infection under favorable conditions was found to cause severe defoliation, with considerable yield losses when it occurred prior to flowering. Isolations were made on potato dextrose agar medium (PDA) from infected leaves collected from the field. The fungus Alternaria alternata was consistently isolated and identified based on morphological characters (Ellis, 1971; Sultana, 1981; Shakir et al., 1997). The fungus grew well on PDA and formed greyish-black colonies of about 90 mm in diameter in 7 days, when incubated at 25Â±2°C. Conidia formed in long chains and were obclavate and muriform, often with a short conical or cylindrical, pale beak, less than one third of the length of the conidium. Conidia had 3-7 transverse septa and usually several longitudinal or oblique septa. Pathogenicity tests were carried out in a screen house on eight-week-old tomato plants of the cultivar 'Pakit'. Test plants were sprayed with a conidial suspension (5Â´104 conidia per ml) of A. alternata isolated from diseased tomato leaves. Control plants were sprayed with sterilised distilled water. All test plants were covered with polyethylene bags for 2 days. Leaf blight symptoms similar to the ones observed in the field started to develop after 4 days and A. alternata was consistently reisolated from these plants. Control plants did not develop leaf blight symptoms. 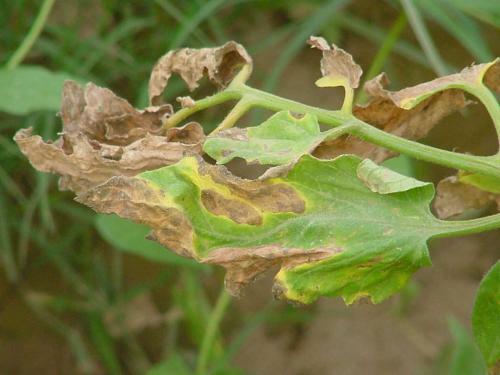 Alternaria alternata has previously been reported in Pakistan as a saprophytic pathogen of tomato causing post harvest losses in high frequency (Akhtar et al., 1994). Among 35 A. alternata isolates collected from rotted fruits from fields and markets only one isolate from the field was able to produce leaf blight symptoms. This shows that A. alternata causing leaf blight in the present study is a distinct pathotype. This is believed to be the first report of A. alternata causing leaf blight in tomato plants in Pakistan. Akhtar KP, Matin M, Mirza JH, Shakir AS, Rafique M. 1994. Some studies on the post harvest diseases of tomato fruits and their chemical control. Pakistan Journal of Phytopathology 6, 125-129. Ellis MB, 1971. Dematiaceous Hyphomycetes. Kew, UK: Commonwealth Mycological Institute. Shakir AS, Mirza JH, Akhtar KP, 1997. New records of Alternaria species from Pakistan. Pakistan Journal of Phytopathology 9, 102-104. Sultana K, 1981. Cultural studies of Hyphomycetes of Pakistan from different habits. Punjab, Pakistan: University of Punjab, MSc thesis.